Summer, on this Coosa River Impoundment, goes just like spring…in stages. 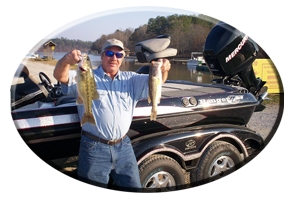 As Neely Henry’s waters begin to warm and bass get in the summer mode (where they will stay for the next 3-4 months), its for sure many of both spotted bass and largemouth bass, will be in some very predictable locations. Its also for sure its going to get hotter and hotter with each passing week! Just like last summer – as we all remember – when those hot, summer days displayed air temperatures exceeding that stifling hot, 100 degree mark. This usually results in a very short day of fishing, or in the case of most Alabama anglers, a change, from chasing bass during the hot summer days to a more comfortable thing called, night fishing. Another problem all anglers encountered during the past summer season is drought. Little or no rain for several months, meant the lakes were slowly lowered (some tremendously) mostly due to the constant water generation for the high demand for electricity. Very odd. When compared to Alabama’s past summer seasons, when just enough rain kept most lakes at full pool. As summer begins many anglers just cannot get over the post spawn blues. Spring, shallow bass and some very hungry big bass coming off the beds, showed some great fishing as usual on all Alabama lakes. That is, just prior to the beginning of summer. So, do hot summer days dictate shallow water anglers (that enjoyed some fantastic shallow water bass fishing this past spring) decisions? 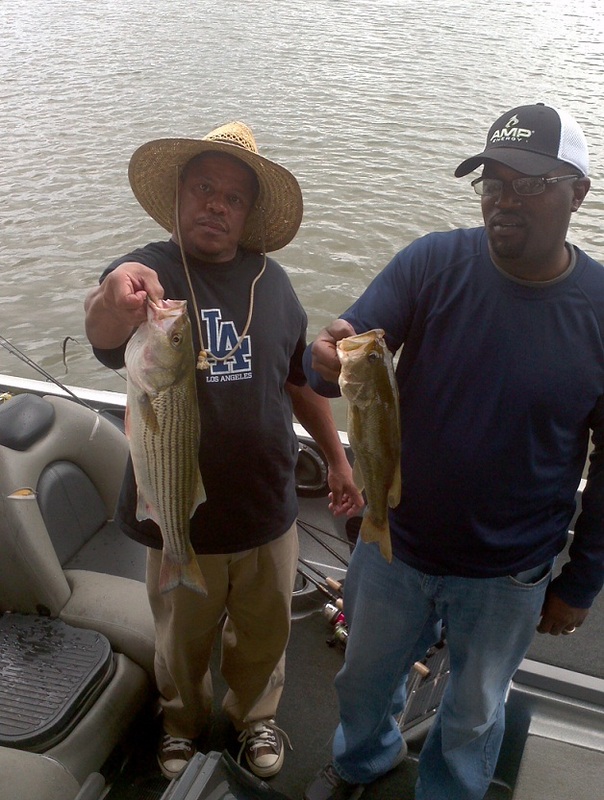 Should they quit fishing for bass in shallow water when it gets hot? No, not by no means. At least not on most Alabama impoundments. There are exceptions, like the deep, clear waters of Alabama’s Smith Lake. 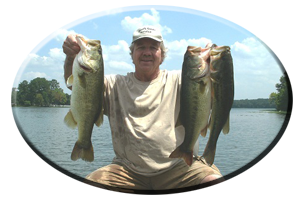 There are many important aspects that provide a distinct advantage for most of Neely Henry Lakes anglers, when fishing for bass during the hot summer days. One is the availability of constant current in the lake. Another is, there is usually a slightly stained look to the water. Both of these conditions always bring bass shallow to feed. Current, positions both the Coosa River spotted bass and the largemouth bass tight to cover. Stained waters always forces bass to move shallow and feed. Current is usually associated with cooler water, of which all species of bass love during the summer months, when main lake waters can be as hot as 90 degrees. Current is more evident on Neely Henry lake in its upper portion, from Gadsden city boat launch to the lakes headwaters. The upper lake waters, is where more narrow, river like conditions occur. This can funnel down the lakes incoming waters, coming off of upstream Weiss lake’s dam waters. Meaning more water then heading downstream in a more confined area. Current is also found in most major feeder creeks, especially after heavy rains or following isolated evening thundershowers. Then there is shade. During the summer months there are shady places found up in major feeder creeks and even on the main lake, all showing some very shady and cooler waters below. Places that can be as much as 10 degrees cooler, than waters nearby often found baking in the hot, summer sun by mid morning. Finding shade – means finding much more active bass and baitfish. Both of which take up residence within this shade during the daylight hours. Places like rock bluffs have shade all day. Overhanging bushes and trees found on the lakes eastern shores, can be sunny in the morning. But these same places (bass avoided as the morning sun rose high), can be very shady when the sun begins to dip down in the eastern skies, often shady as early as mid day. Another excellent set of circumstances where shade is found, is in the mid-to-far back ends of major feeder creeks or the backs of deep cuts and shady pockets. These places, often far from the main lake waters, can hold loads of shade-seeking bass this summer. They can be found in huge schools lounging around the shade provided by over hanging trees, bushes, piers, boat houses, rock walls, bridges, culverts and even along the bends of a twisting, turning creek channel. So think of Neely Henry’s bass as they go through these stages this summer season and like them, you should always pay attention to your surroundings. Early summer, shows some very rich and green grass growing lake wide and this oxygen-rich environment holds bass even when its hot at midday. Wood cover, rock cover and man made cover like bridges, piers, boat houses and marinas have resident, summertime bass as well. 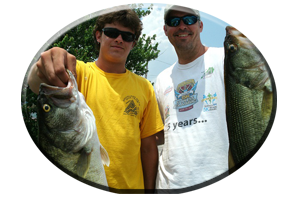 Especially bass tournament release sites around marinas. Some marinas hold bass tournaments all week during the summer months. These marina release sites can have bass that have been recently let go, from 2 – 3 daytime tournaments and 2-3 nighttime bass tournaments. Each week this takes place all summer long, meaning hundreds of bass are let go around these locations, just waiting to be caught again! By July – mid summer, its hot! Things begin to show a definite change lake wide. Little or no rain can show the lake begin to fall fast. Places you caught bass in this past spring could be high and dry with summer drought taking place again. Night fishing shows less anglers on the water so a half day trip from around dawn until about 11 a.m. may be in store. Or you can venture out in the evening, as the sun begins to set and then fish in peace and solitude until midnight or all night, in some cases. As for lures – you name it. Summer is when bass will hit every lure in your tackle box (es). From shallow water to deep water there is a set of lures for every situation, so bring plenty of choices. Topwater lures are good both during the day and at night. So are spinnerbaits, jerkbaits, rattletraps and crankbaits. Yes, bass will hit all of these lures and other lures, both during the day and at night. I have even caught bass during the day on jigging spoons in deep water and continued on into the night fooling them in deep water with spoons and tail spinners. 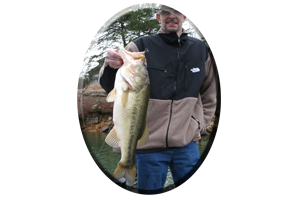 Fishing on bottom on Neely Henry Lake, both during the day and at night, calls for both Finesse Fishing with small lures and light tackle outfits and Power Fishing with heavy line, stought rods and with strong, wide spooled, high ratio reels. These can be coupled with various types of heavy monofilament line, braided line or fluorocarbon line. Try them all, each type of line, each has its own application. Small worms, small lizards, mini-size crayfish or small jig combos and tube baits, may be needed for finicky, spotted bass often encountered during summer in clear water situations. This may call for the use of a drop shot rig, Texas rig, Carolina rig, or a small plastic lure rigged on a small jig head. Day or night, these lures (and a slow presentation), works all summer long on this lake. 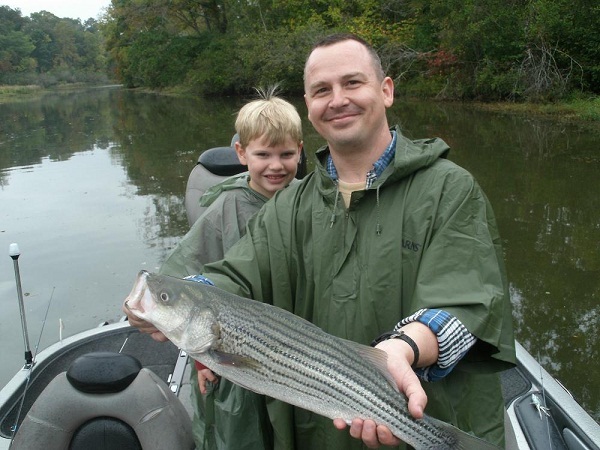 Fishing with bigger lures on Neely Henry Lake can mean targeting bigger bass, meaning being ready with heavier line, sharp hooks and strong equipment. Whether you day or night fish. Try oversized 10-12 inch worms, 8 inch lizards, big gaudy jig combos, multi-legged creature baits and even oversized soft plastic shad imitations or swim baits. These types of lures can be deadly temptations for big bass on Neely Henry lake this summer, both during the day and at night…all summer long. * Summer is a good time to experiment, for there are many lures that will fool these bass. But only if you tie them on and give them a try. These lures will not work when they are collecting dust in your tackle box. Give Neely Henry Lake a try this summer season. 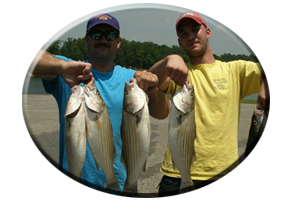 Or call on Reeds Guide Service (205) 663-1504 to book a trip to this lake or any Alabama lake, year round. Several guides and boats available year round. Discounts available. See my website www.fishingalabama.com for info.